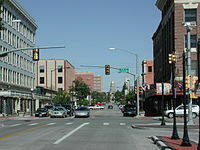 English: Media related to Cheyenne, Wyoming, a city in Laramie County, Wyoming, United States. The city is the capitol of and most populous city in the state, as well as the county seat. Media in category "Cheyenne, Wyoming"
This page was last edited on 18 June 2018, at 22:21.